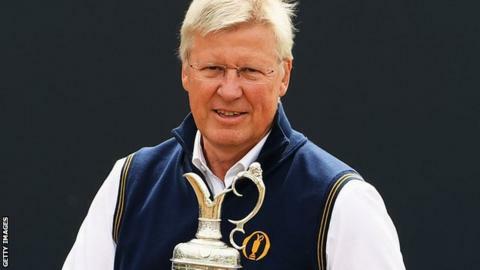 R&A chief executive Martin Slumbers has revealed he has "significant concerns" about staging The Open at Royal Portrush because of Brexit. Slumbers said the organisers "will make it happen" but admitted he will be happy when the tournament is over. The Northern Ireland course will stage The Open for the first time since 1951 from 18-21 July. "We as a management team have spent a lot of time looking at contingencies and what we need to do," Slumbers said. Tickets for the championship days at the County Antrim venue have already sold out. The decision to bring the event to Portrush was announced in October 2015, eight months before the referendum to leave the European Union. Since then, there has been uncertainty surrounding the backstop to retain an open border on the island of Ireland, which is causing concern for golf's governing body. "We are concerned that we start building in April," Slumbers told BBC Sport. "What will be the situation? Will there be any border or not? We need some certainty. we need to know what rules we need to comply with. "We have developed multiple contingency plans. We've advanced some, deferred others, but like every business we're trying to work contingency plans into an uncertain environment. "We'll make it happen though." Slumbers added: "In hindsight, would I be wanting to do Portrush in the year that we would be potentially leaving the European Union without a deal? No. "The future of the border is the number one concern. We have over 2,000 containers, some from as far afield as the Middle East, to get across the Irish Sea and we start building on 2 April. "We have engagement with ministers and Parliament but the concern is all around certainty. If you know the rules you're playing by then you can play, you optimise what you've got. "The problem is we don't know whether to reschedule to bring all our containers in through Dublin (Republic of Ireland), whether to move them through Belfast (Northern Ireland), whether to ship them out of the UK now. "It doesn't threaten the staging, we will make it happen. It's just more complex than we anticipated. For the insiders it's a bit harder but for everyone outside it won't impact at all, they won't notice."